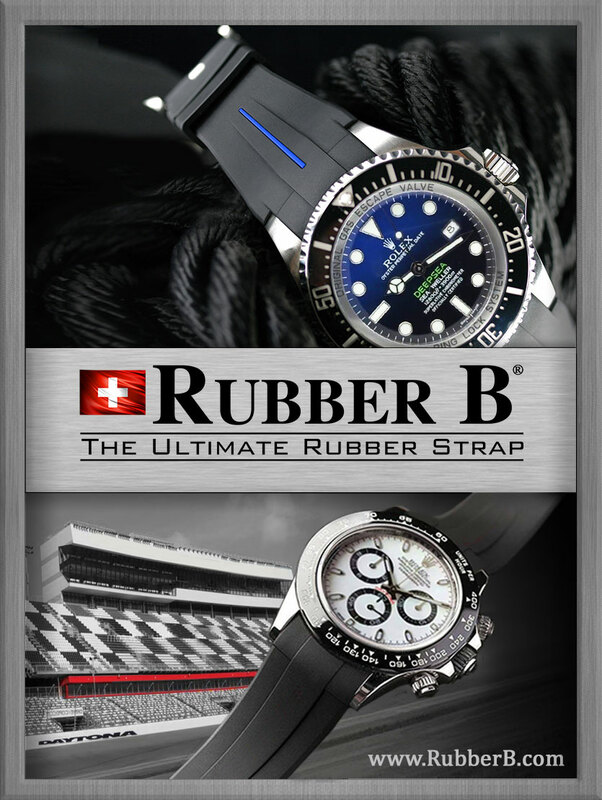 This is such epic news, I had to borrow Hodinkee's Breaking News moniker again for this story!!! I just discovered that NASA Apollo 11 Astronaut wore a yellow gold Rolex Day-Date for 34 years, which is pictured below. 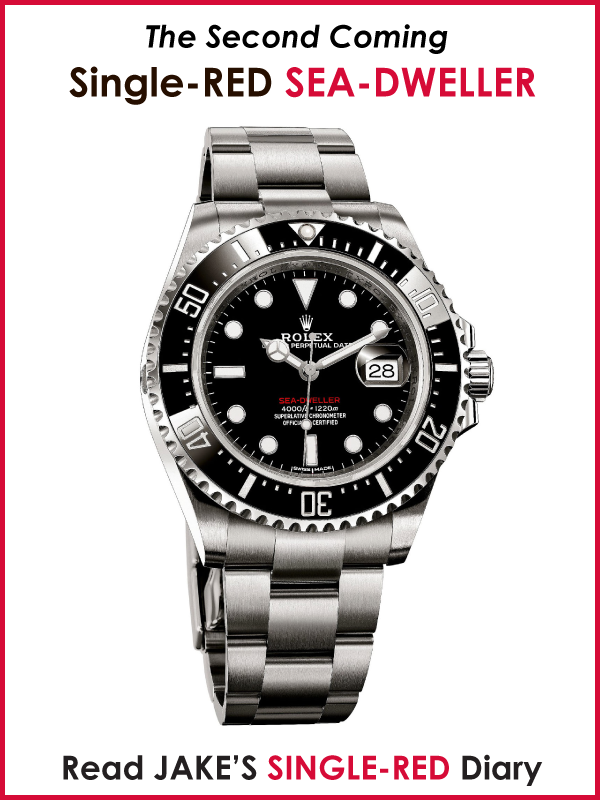 The watch was recently auctioned by Sotheby's, and in the description Michael Collins mentioned he wore it for 34 years. 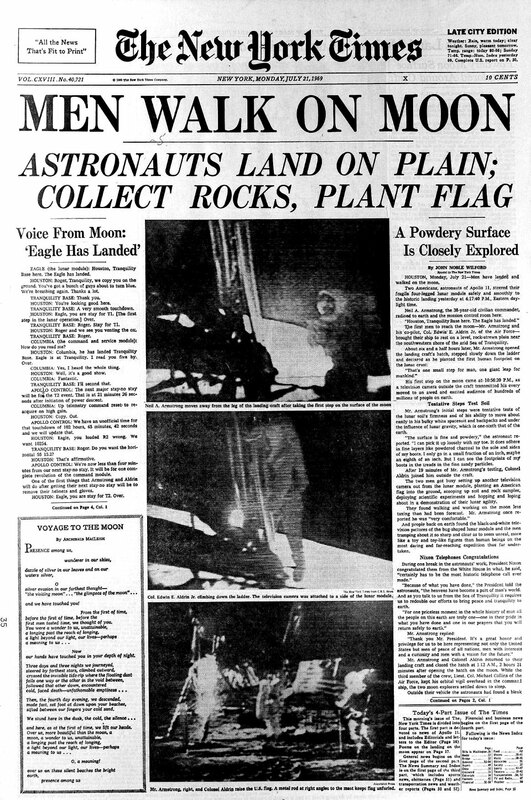 This is such an apropos discovery as we are now celebrating the 50th Anniversary of the Moon Landing!!! 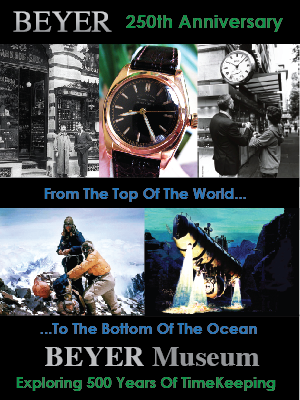 The photo above and below are of Michael Collins Rolex Day-Date and we see he had an engraving of his initials. 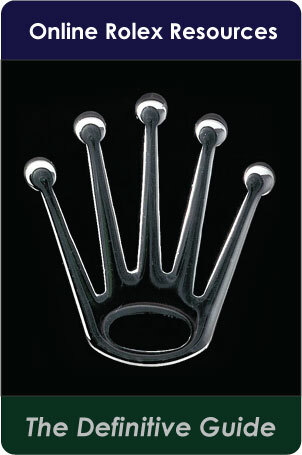 Notice the band has a "69" engraving, which means it was made in 1969. John Glenn of Mercury 7. Frank Borman of Gemini 7 and Apollo 8. 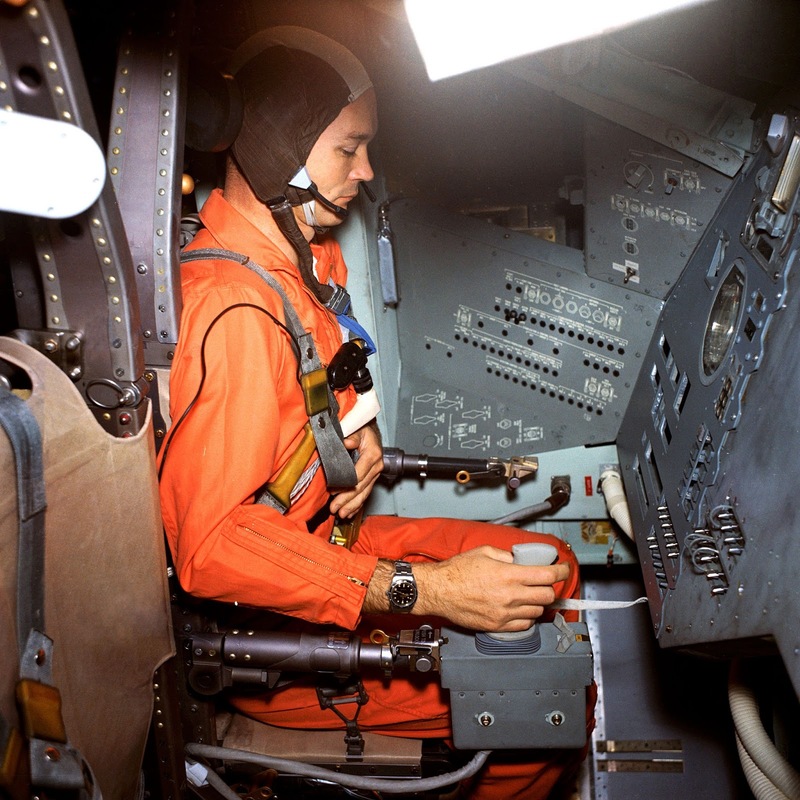 Pete Conrad of of Gemini 5, Gemini 11, Apollo 12, Skylab 2 (Discovered by Nick Gould). Richard Gordon Jr. of Gemini 11 and Apollo 12. 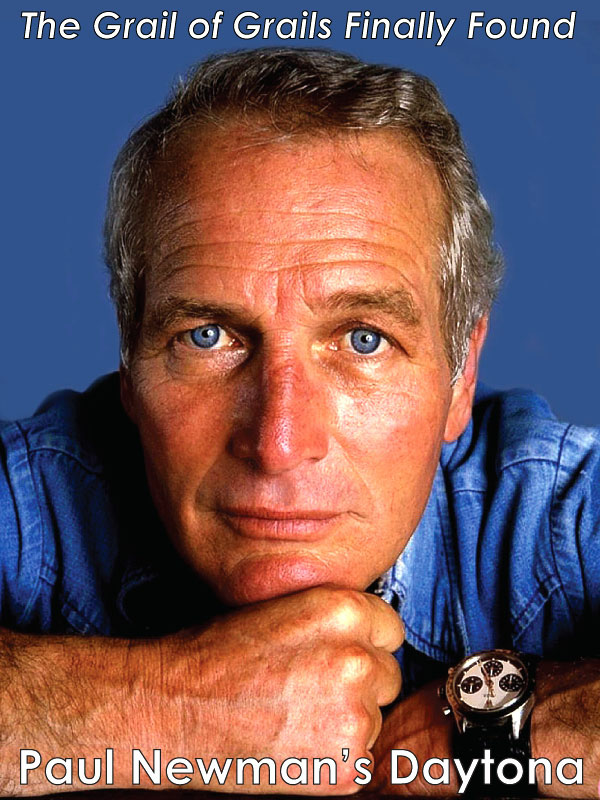 (Discovered by Nick Gould). Lloyd Blaine Hammond of 1991 Space Shuttle Discovery Mission STS-39, and 1994 Space Shuttle Discover STS-94. 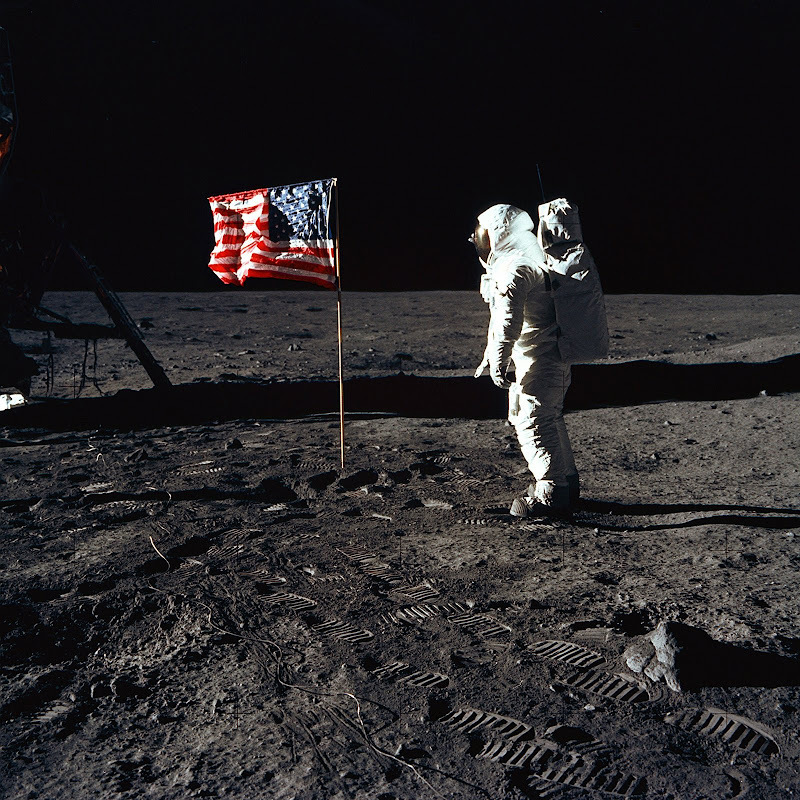 This week celebrates the 45th Anniversary of the Moon Landing and exploration, which remains one of mankind's greatest achievements. 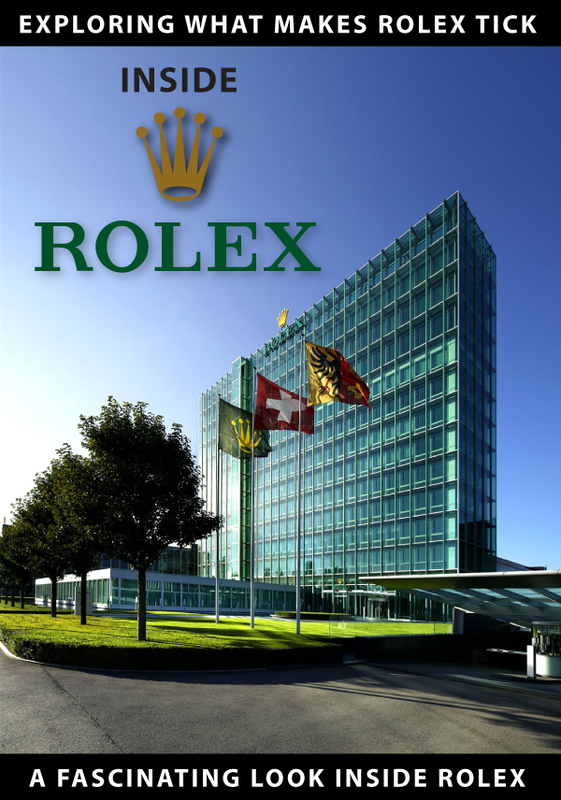 In 2008, on Jake's Rolex World, I first began documenting the fact that many NASA Apollo Astronauts wore Rolex watches, and many of them wore their Rolex watches to the moon and back. 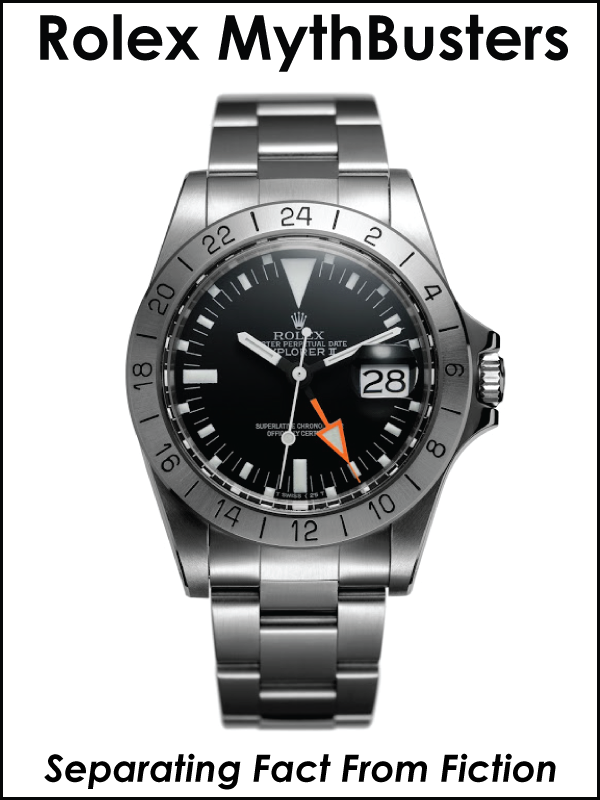 Prior to this discovery, the common believe was that Apollo Astronauts only wore Omega watches, but over the past seven years I have busted that false myth. 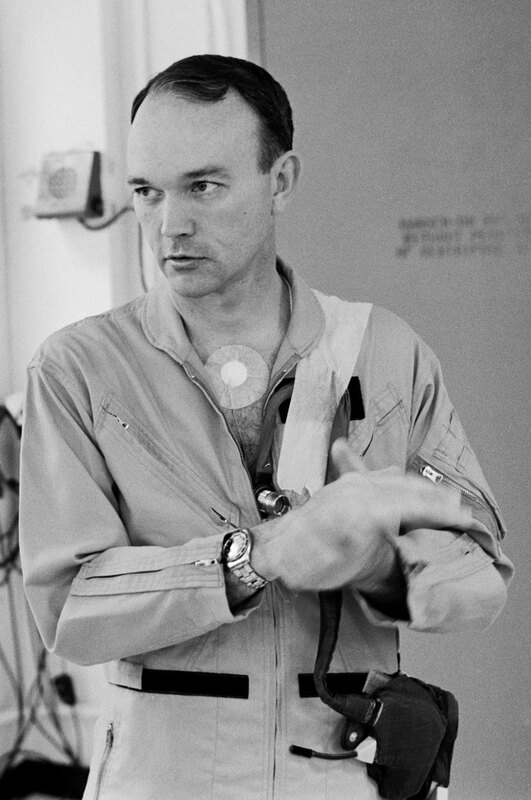 Michael Collins is pictured below at NASA on April 16, 1969 during centrifuge training for Apollo 11. 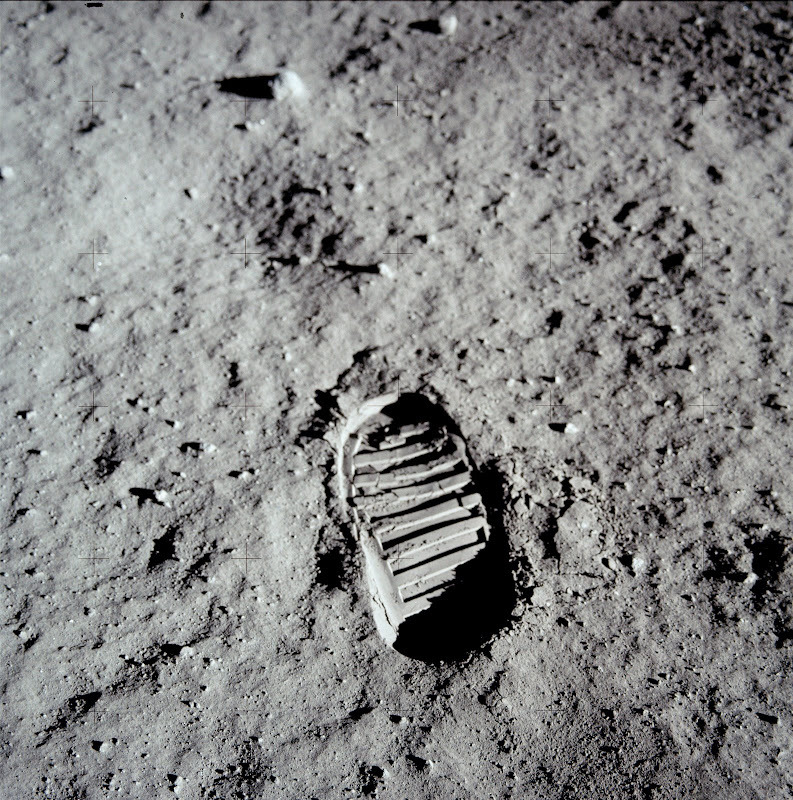 Three short months later he would fly into the history books as part of the first team to land on the Moon and return safely to earth. 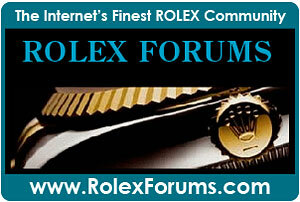 In the photo below NASA Astronaut Michael Collins is wearing a Rolex Turno-graph. 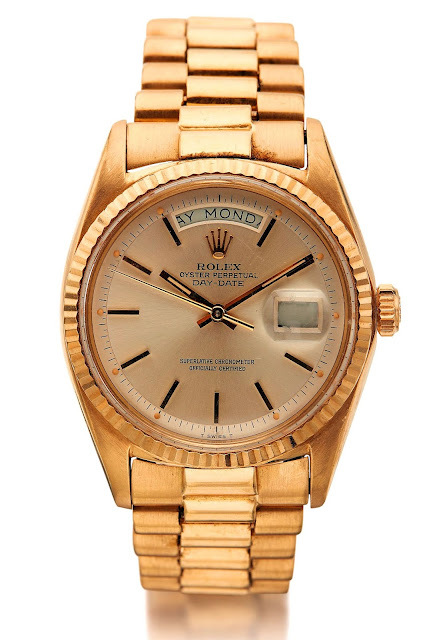 Michael Collins' Rolex Turn-O-Graph was an early model, which had a gilt dial, and it is interesting to note that these first generation Rolex Turn-O-Graph models looked and functioned similarly to a Rolex Submariner. 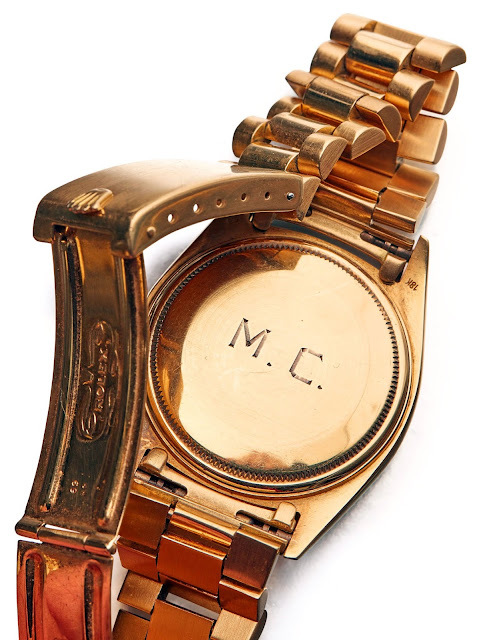 In the close-up photo below of Michael Collins' Rolex Turn-O-Graph, we not only see the gilt dial and hands, but also the early models of the Turn-O-Graph featured all 60 second markers on the black bezel insert. 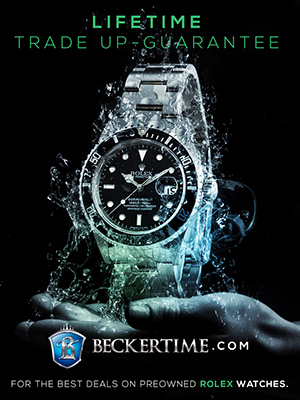 This design feature predated the Rolex Reference 5517 Milsub, as well as the Rolex DEEP-SEA, which also have this feature. Years ago, I published lower resolution versions of the images above, and today I am publishing for the first time, the image below of Michael Collins, which shows him as he prepares minutes before the photo above was taken. 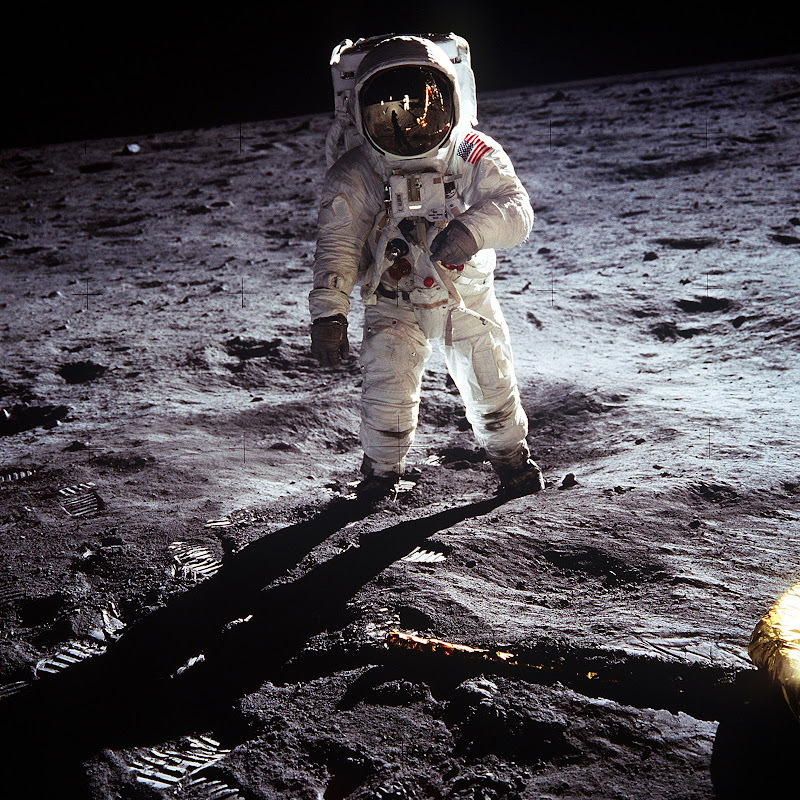 This photo below is obviously black and white, but he is wearing the orange jumpsuit as pictured above, and you can see him holding his headset in his hands below, that he is wearing in the photo pictured above. 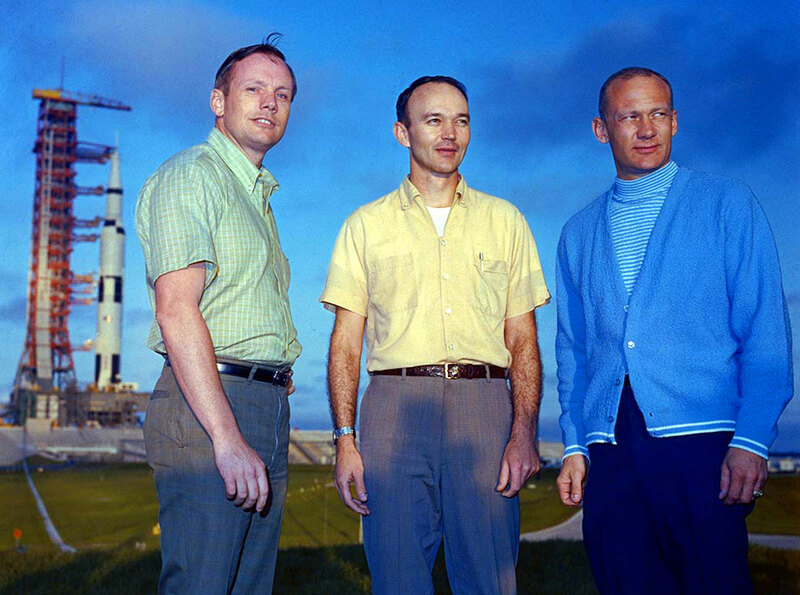 Pictured above and below are the prime crew of Apollo 11 lunar landing mission. 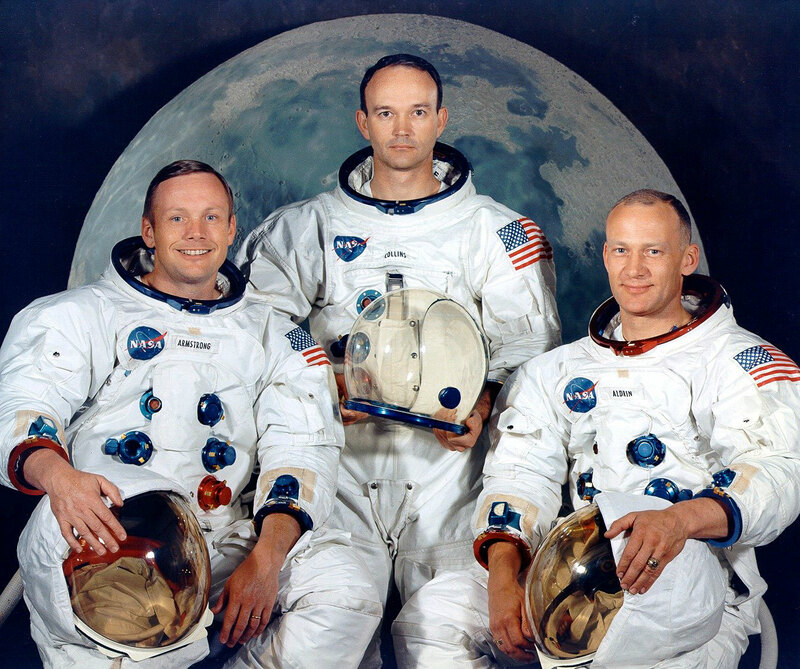 Left to right are Neil Armstrong, Commander; Michael Collins, Command Module Pilot and Edwin "Buzz" Aldren Jr., Lunar Module Pilot (May 1, 1969). 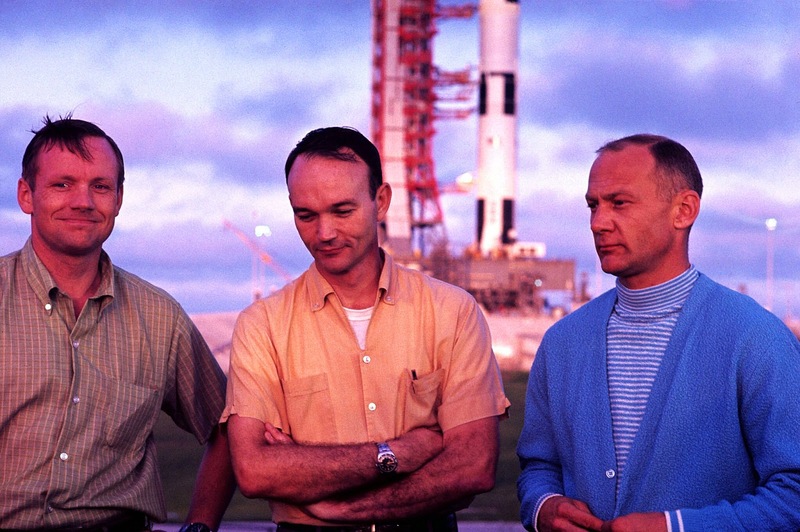 Notice in the photo above that Michael Collins is wearing his Rolex on his right wrist as he posses with his fellow crew members, in front of the Saturn V at the Kennedy Space Center that would soon take them to the moon and back. 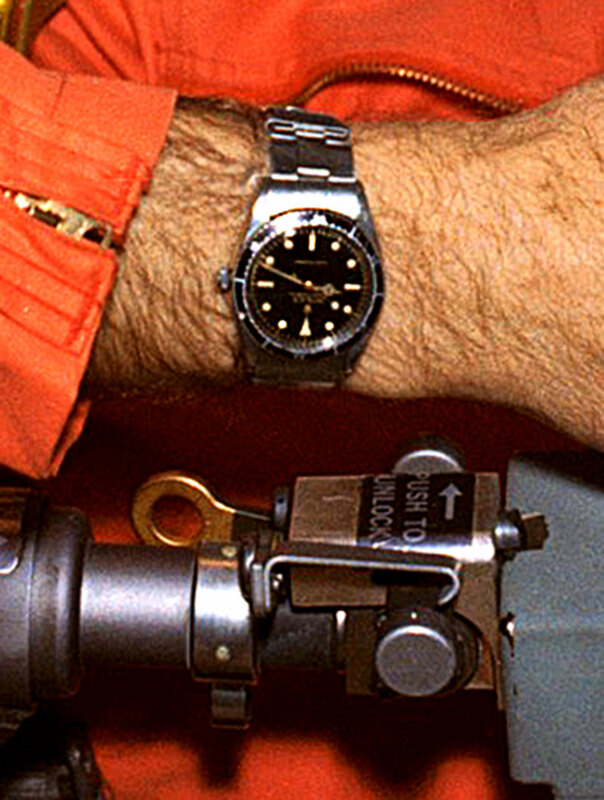 The Rolex Turn-O-Graph Michael Collins is wearing looks remarkably similar to the Rolex Submariner, but its slightly smaller. 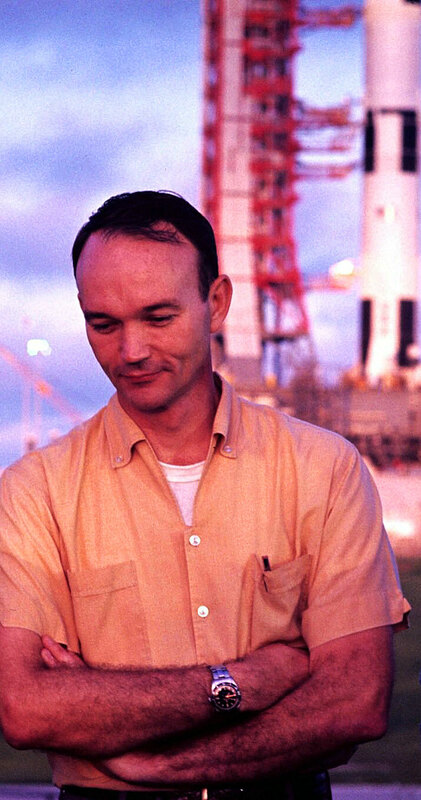 Michael Collins was a U.S. Air Force test pilot prior to becoming a NASA Astronaut. 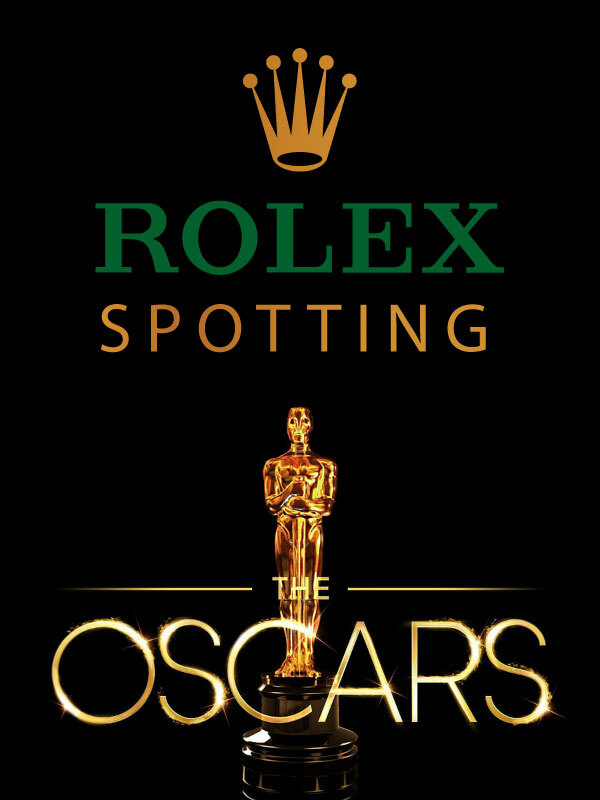 So the obvious question, is wether or not Michael Collins wore his Rolex to the moon and back? 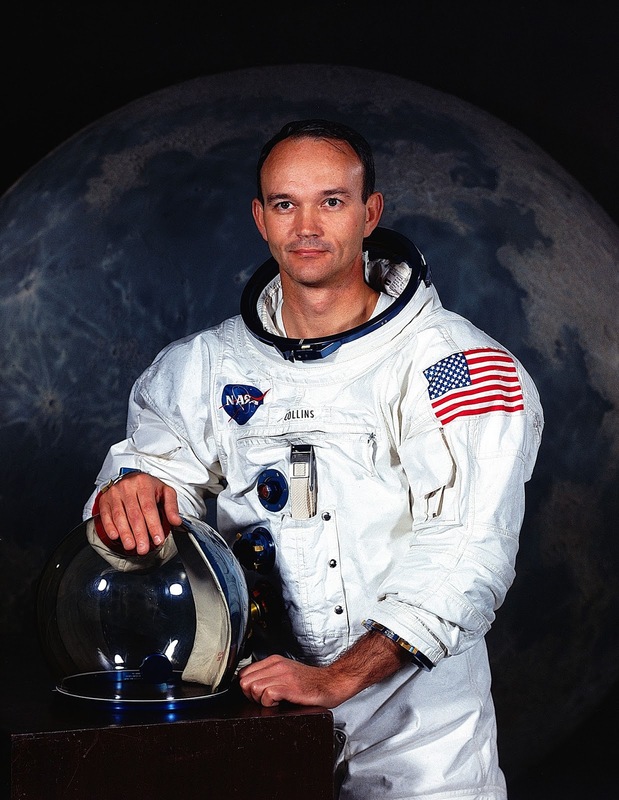 Michael Collins official Apollo 11 NASA portrait is pictured below and if you look carefully, you can see he is wearing his Rolex Turn-O-Graph!!! 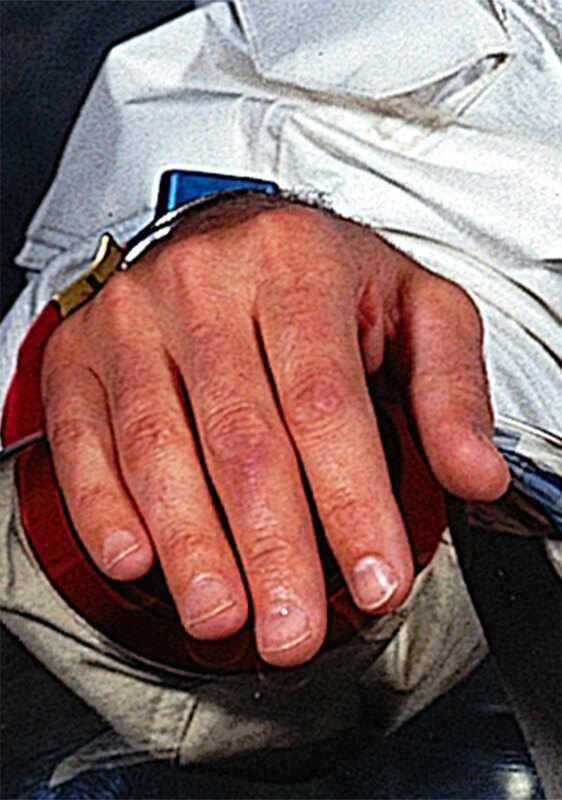 We can tell Michael Collins is wearing his Rolex Turn-O-Graph in his official Apollo 11 portrait (pictured above and below since we can see the grooves/notches on the side of the bezel, which allows the user to spin the bezel. 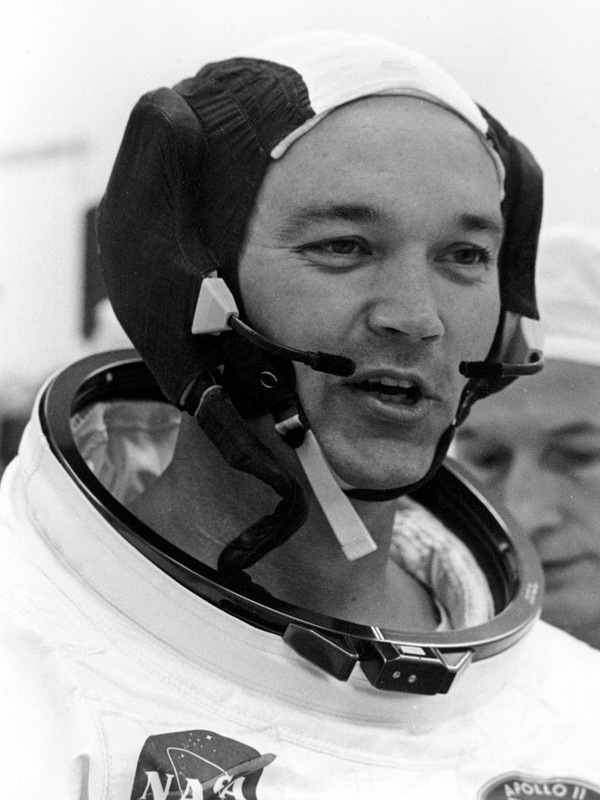 Michael Collins is pictured below as he suits-up to leave for the Moon on Apollo 11. 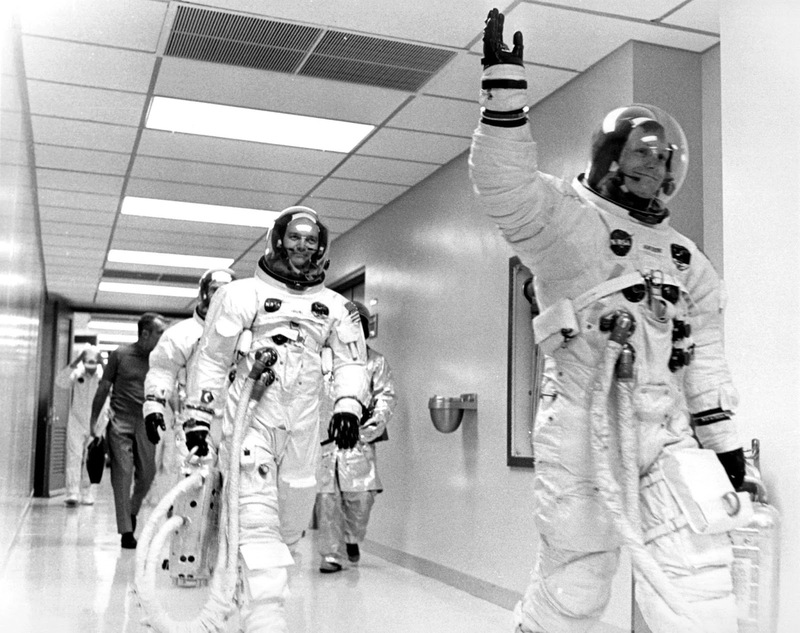 Michael Collins is pictured below (second in line) as he and his Apollo 11 team members leave for the Moon. 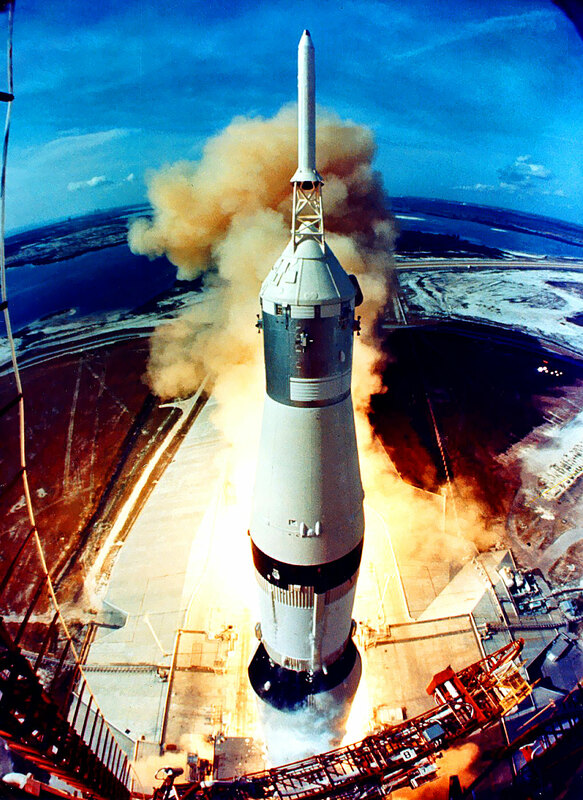 The photo below shows Apollo 11 taking off to head for the moon. 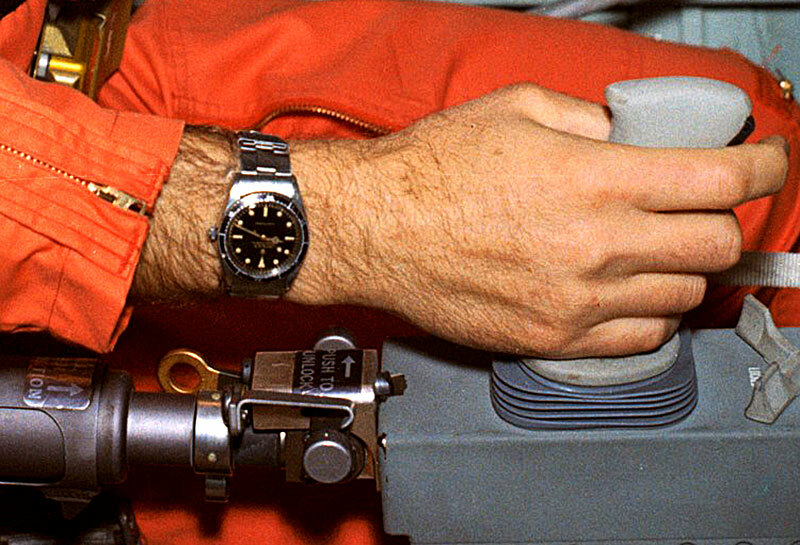 In this next photo we see U.S. President Lyndon Johnson wearing his trademark yellow gold "Rolex President" Day-Date as he watches Apollo 11 take-off for the moon on July 16, 1969 at 9:32am EDT. 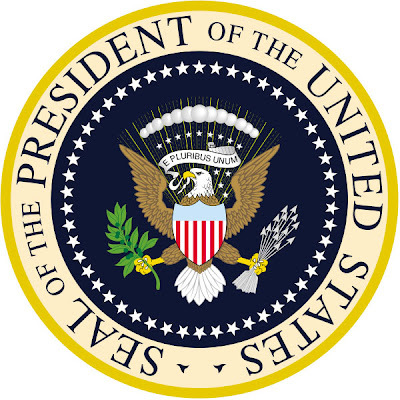 U.S. Vice President Spiro Agnew is pictured on Johnson's right and Lady Bird is on his left. Historical Note: The photo above of U.S. President Johnson is a bit ironic because he was no longer President when this photo was taken. 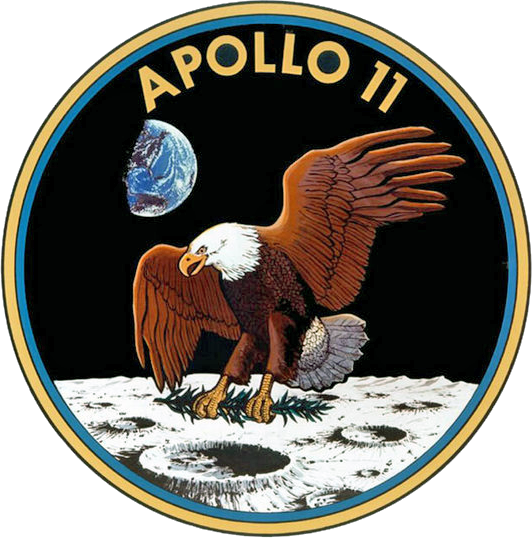 At the time Richard Nixon was the President of The United States and he did not attend since he was paranoid the launch might fail. Instead he watched the launch live on TV from the Oval Office. 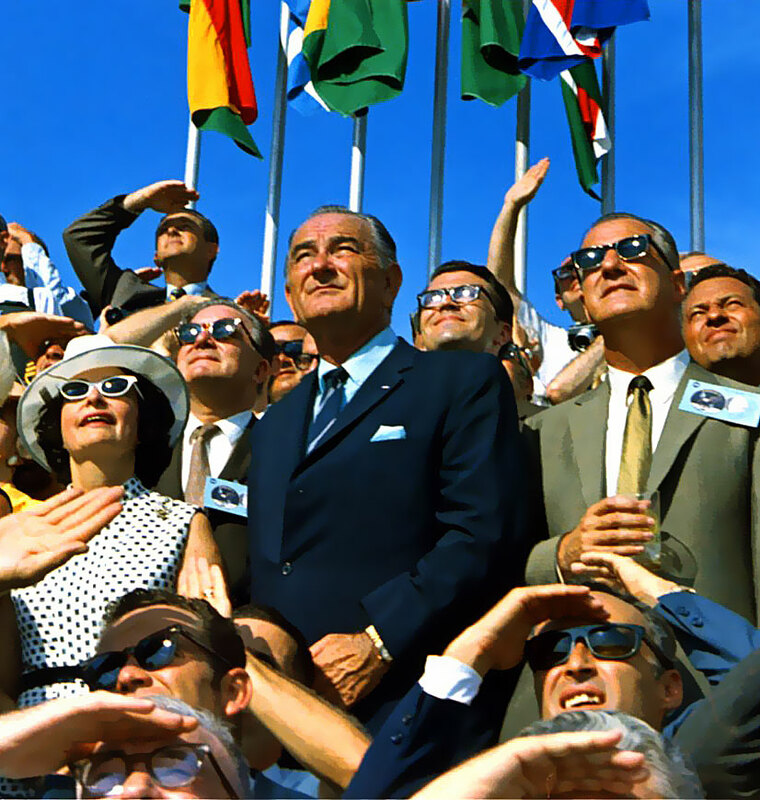 Another irony, regarding the photo above is that Lyndon Johnson was able to witness first hand, what he had helped develop at the beginning of the Kennedy administration back in 1960, when he served at the Vice President Of The United States. 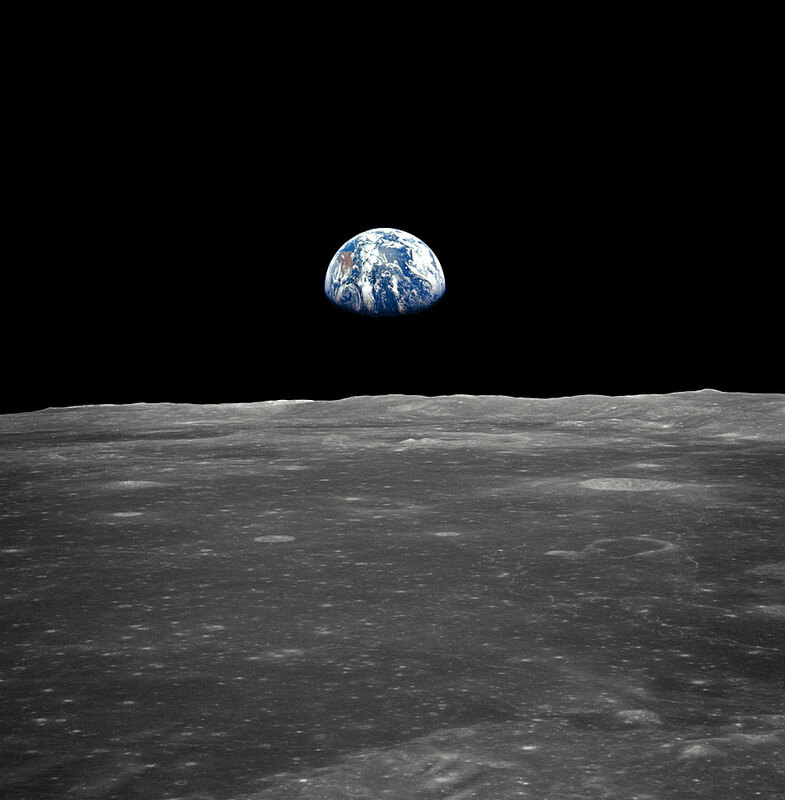 The video below of JFK giving his famous September 12, 1962 Moon Speech is deeply profound, as it set the course for the amazing achievement of Apollo 11. 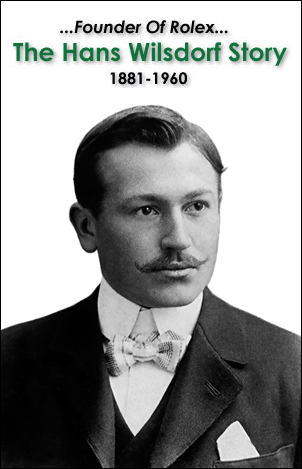 The image below is of major historical significance. 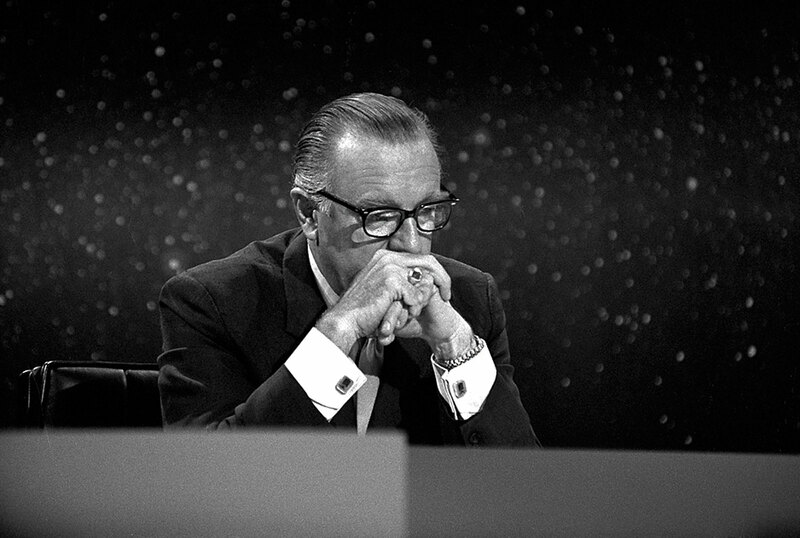 We see Walter Cronkite on July 20, 1969 as he keeps his eyes glued to his monitor as NASA's Apollo 11 Mission touches down on the Moon for the fist time, and notice that Walter Cronkite is wearing his trademark two tone Rolex Datejust on a Jubilee Bracelet. 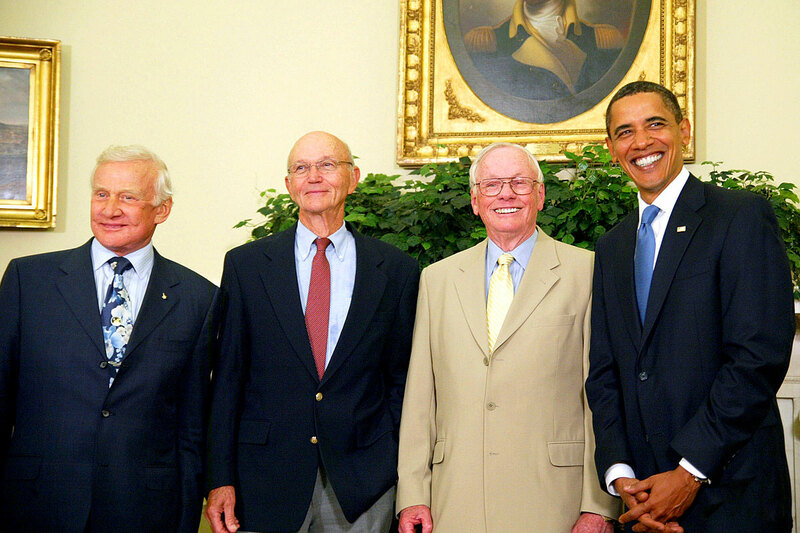 In the photo below that was taken on July 20, 2009, we see the three Apollo 11 NASA Astronauts, Buzz Aldrin, Michael Collins, and Neil Armstrong in the Oval Office with President Obama. 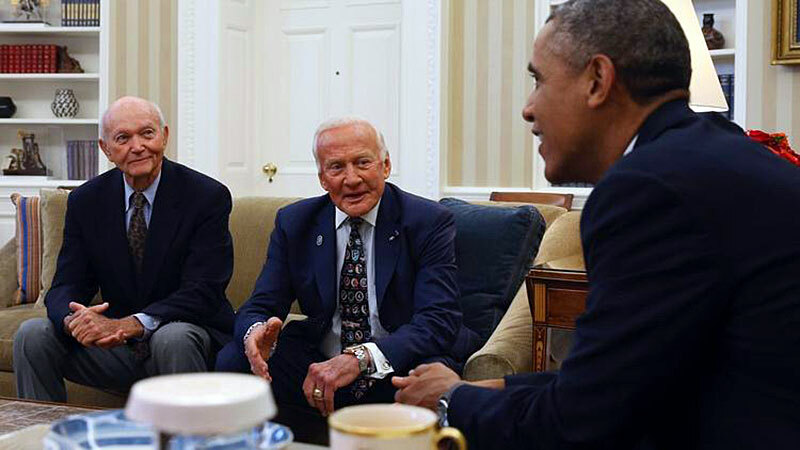 U.S. President Obama met with the two surviving Apollo 11 Astronauts, today in the Oval Office to celebrate the 45th anniversary of the Moon Landing. 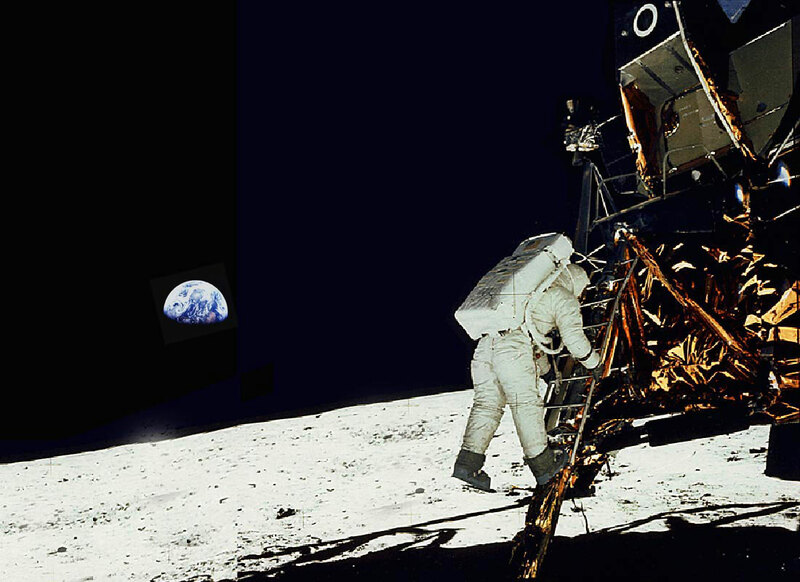 Unfortunately Neil Armstrong passed away recently, but Michael Collins was there! It is a trip to see how similar, yet different Collins looks today from the way he looked in 1969.